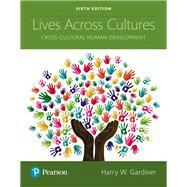 Lives Across Cultures: Cross-Cultural Human Developmen t focuses on cultural similarities and differences in human development throughout the world and across the lifespan, while emphasizing the links between theory, research, and practical applications. Presented chronologically by topic, Harry Gardiner’s Sixth Edition combines the most current information with engaging vignettes, stories, and personal experiences in his highly praised, scholarly yet conversational, and often humorous writing style. Harry Gardiner is Professor Emeritus at the University of Wisconsin—La Crosse with degrees from American International College (BA), the University of Hawaii (MA), and the University of Manchester, England (PhD), where he met his wife, Ormsin, of Thailand. Married in both Buddhist and Christian ceremonies, he taught at Chulalongkorn University in Bangkok for two years. He and his wife have four children and six grandchildren. He has engaged in training, teaching, and research in Europe, Asia, and the United States. Dr. Gardiner was a charter member of the International Association for Cross-Cultural Psychology and served as president of the Society for Cross-Cultural Research. In addition to publishing articles in a wide variety of journals and participating in national and international meetings, he has co-authored a number of chapters on cross-cultural topics for other books. He enjoys watching the development of his six grandchildren as they navigate a much more culturally diversified world than he, or his children, experienced at their ages.